If you’ve ever wondered if you could make Chai Tea Lattes at home, Jaipur Avenue has the answer: You Bet You Can! As I’m writing this out (on paper to type in tomorrow morning), I’m thoroughly enjoying a hot mug of Original Masala Chai Tea from Jaipur Avenue. They sent us several packets of EACH flavor to review, so I can re-experience the wonderful drinks all over again. Jaipur Avenue’s cool like that. Bless them. The Jaipur Avenue Chai Tea Mix Ginger tea review has a bizarre back story. I intentionally saved the packets marked “Ginger Chai Tea Mix” to review last. Why? If I didn’t like it, I would feel less guilty about pretending it never happened if I’d already written several positive reviews. I was afraid it’d be… well, horrid. Ginger and I have a complex relationship. It’s like nutmeg – they both smell absolutely Heavenly and (when used properly) they taste heavenly. However, give them an inch and they’ll take a mile and they’ve been known to overpower foods and drinks to the point of tasting… you guessed it, horrid. The day came for me to taste the Ginger Chai Tea and I further insulted it by varying my routine. You see, one of the most SPECIAL parts of my day is the evening. After the day’s work, chores, walking, cooking, and errands are all behind me. The supper dishes have been washed and the kitchen light’s off. I’ve found my way into my pajamas and my cat and I find our way to the couch with my husband for a little tv (more times than not, it’s for a St. Louis Cardinal’s baseball game or a UK basketball game). I always take a cup of hot tea along to help turn the special time into SPECIAL time. I had enjoyed every other Jaipur Avenue Chai Tea drinks during this SPECIAL time (just as I’m now enjoying the original Masala cup as I write this review). However, I made the Ginger Chai Tea earlier in the day. It wasn’t going to muck up my special time! As my water boils, I open the packet of Ginger Chai Tea Mix and pour it into the mug. I double check the package. Yep, it says Ginger. I pour the boiling water into my mug, stir well to make it nice and frothy. I take the first sip and my jaw drops. I double-check the package again. Later that night, I enjoyed the second cup of Ginger Chai tea mix (along with another cup of Jaipur Avenue Chai Tea) during my SPECIAL time. Twice the tea, twice the special. This is my final review of the Jaipur Avenue Chai Tea Mixes, but I hope you’ll go back and read my other reviews. This is an extremely high quality product and it will blow you away. 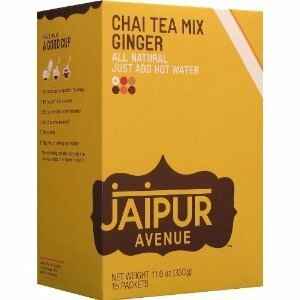 Buy Jaipur Avenue Tea Mixes on Amazon. Personally, I’d buy the Jaipur Avenue Chai Tea Mix Variety , so you can enjoy a trip through the flavor of India as I did, one at a time. Then, when you see what your favorites are (trust me, there’ll be more than one), you can order them specifically. My first orders will be the Original Masala and Vanilla but I’ll be ordering the other flavors as well… including the Ginger. It is surprisingly delicious.